Dear Friends,I'm writing with a grateful heart from Open Hands' new offices in Harlem. This year, more than others, we have cause to give thanks: We are experiencing an explosion of growth. Through November of this year, Open Hands provided legal aid, prayer, hope and stability to almost 600 poor or disenfranchised individuals. That’s already a 90% increase from all of 2012. Our budget has grown from $36,000 to $112,000 in just 18 months. Through collaboration with our partner organizations, we opened an office in Harlem to centralize our operations and better serve our low-income neighbors. 2) Please, help. God is moving. Our mission has blessed so many. But rapid growth means urgent needs. Because of the uneven economic recovery, homelessness in our city is on the rise – and is now higher than ever. A recent feature in The New Yorker aptly put it this way: “Yankee Stadium seats 50,287. 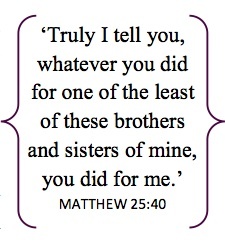 If all the homeless people who now live in New York City used the stadium for a gathering, several thousand of them would have to stand.” So, as Christians called to help the poor, we face a very difficult question: What are we doing to preventtheir poverty in the first place? Open Hands prevents homelessness. Consider Dean, a 76 year-old New Yorker that makes less than $27,000 annually. Dean’s income has not increased in twenty years. But his rent increases 7% annually. Dean was on the path to homelessness. He didn’t know what to do. 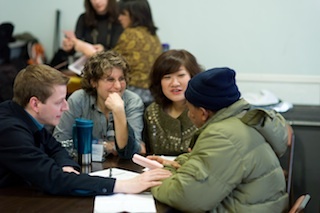 Dean found Open Hands’ legal aid desk during a meal at The Father’s Heart soup kitchen. Our volunteer attorneys listened to Dean’s story and advised him that he is eligible for a senior citizen rent increase exemption. Open Hands helped him apply for the program. We prayed with him and for him. Dean kept his home. Dean found hope. Dean’s story is one of hundreds that we address at Open Hands. Whether through preventive legal measures, advocating for the disenfranchised, or providing prayer, our services are efficiently meeting a great need. But too many client services have fallen short due to insufficient funds. Now, we are asking for your continued support. Our goal is to raise $45,500 in the next six weeks. We must increase staff and operations to support to our rapidly growing client base ($36,500), expand our assistance to entrepreneurial ex-offenders ($5,800), and purchase a vital client database system to keep up with our operational demands ($3,200). Some of you can give $5,000 today, and that is needed. Others can give less; that is absolutely needed as well. If 150 people each gave a year-end tax-deductible gift of $300, we would meet our needs for the end of the year and into 2014. Again, these financial needs are urgent. But in addition, I need you to pray. Pray for people like Dean, who don’t know their rights, who are on the verge of poverty, and who don’t have the hope and stability that only God can give. This Christmas, will you help us share that hope? Together, we have the chance to answer God’s call to “seek justice and help the poor.” In this time of miraculous growth and demand, He’s given us an amazing opportunity. Right now, we have the chance to respond.